"In cooperation with the University of Wisconsin"--Cover. "Preliminary copy for review only"--Cover. 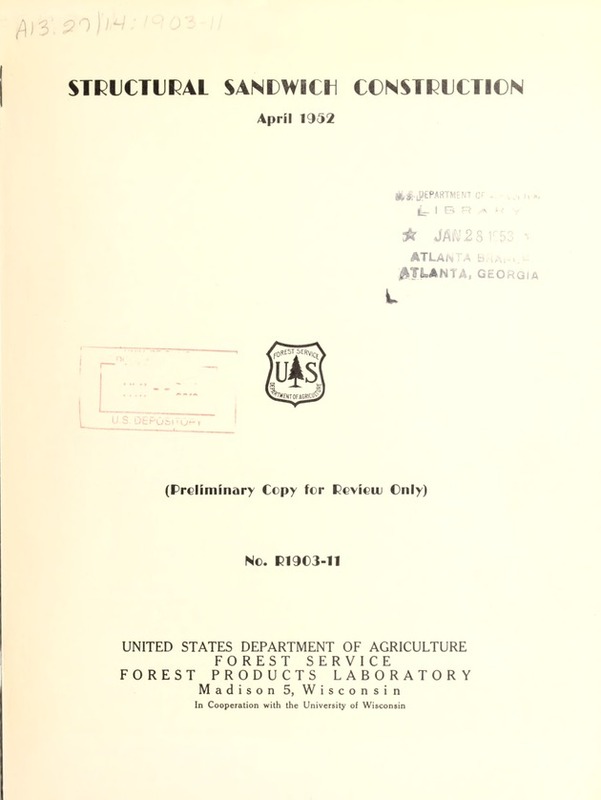 Forest Products Laboratory, Forest Service, U.S. Department of Agriculture. Structur'.l santKch cs. structi.on is a i:r c -..trui to 0 .
dc:se r.c. r la1 si.c t.;y aro the r.'. .
ptio toits i2bht. Sa'dvdc, construotilon is ;' :C:1o;L: . ecrhc is usoxd to i Ls best a*t!onfoa . hose- an 'rLa2sion-r1sistant fcin. ca. be Is.d for tr t,'p faci' . plastic fcin2 s fo. 'r .i.s. n, d s t : ther1 ii o." ril can b c'son to 1 rovid: thcrrnma insulation fir. resistc n .
lJintaincd rt '.>'.l:on, ) is., in coo rrt ion -L.th tih iii 'f-,: oi it,, .sin. in com. pesion, ond for possible wrinkling of the facings. the sandwich construction, because it usually has a low modulus of elasticity. of equal or unequal thickness is given by:. <.' c .:7 is ^r. app I d, especiailT if they are'r m Ctliic. bei.g t tthe facin,- en be obtain d.
iI te a1 during m-nufact t .U'c fter it is completed. ( B Lia, ". "0 0nd T < . 3-) ...y^ . .i L0. (I) :I.E: '. :, r r;* A.HV T A.: A.T an .~ri iL -, J. / .-ic. t* i) ,i .r . U ^. FLI-.JJ --~d. IT .j -rlT 'Q l d S~ P O'S 'D'J:H 1'"
(, u. S. F L R- T: i .S..
.... .i FO A.I. ', r. TI: FAARI- . ::A L.
3, ^ -'init~iors ''' ard. i. n.e :'._oncy LchLcal a r 1o. 7, 23 u fil 7,.